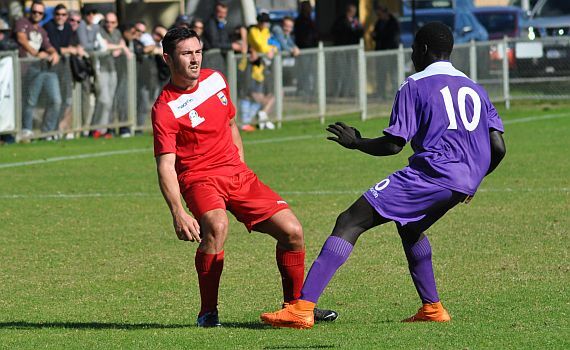 ECU Joondalup under 20’s skipper Ryan Malton has led from the front this season, and he can’t wait for Saturday’s Cool Ridge Cup Final against Bayswater City at Dorrien Gardens. The 20-year-old, has been solid at the back and also popped up with two league goals this season. Malton said Saturday’s opponents are a good side, but he thought they deserved to beat them the only time they played this season. “We played them earlier on in the year and it was a pretty even game, but we all know Bayswater are no push over and shows on where they sit on the table,” he said. ECU under 20’s Coach Howard Tweets said Malton’s leadership has been fantastic for his young side this season. “Captain Courageous – Every good side needs a good leader. Within our 20’s we have ours in our captain ‘Moltz’,” he said. “Despite his youth he displays a maturity on the pitch and is a true leader by example. All be it by a number of months, Ryan was selected as captain due to his seniority initially, and jokingly we commented it was because of his greater experience, a decision totally vindicated. As captain he never shirks responsibility, wears his heart on his sleeve, and is willing to put his body on the line backed by a tremendous will to win. ECU warmed up for the Cup-Final with a strong 5-1 win against Floreat Athena on Saturday, and Malton said the team is ready and all fit for a massive game and if they continue their good form against the top sides, then Saturday could be a great occasion for all involved. “Like I said we’ve had some tough teams in the lead up to the final, but I think it’s shown every other team, and ours, that we are capable of being at the top when we work as a unit,” he said.